Magic Kingdom becomes a winter wonderland as Mickey Mouse hosts a celebration “yule” surely love! Delicious treats, classic characters, carols, dancing and so much more will put everyone in the holiday spirit! Mickey will be hosting his Very Merry Christmas Party for 23 nights during November and December. Tickets to Mickey's Very Merry Christmas Party for guests ages 3 and older start a $95 in advance or $105 at the gate, if available. Prices may vary depending on event night. Mickey's Very Merry Christmas Party is separate from general admission and requires a ticket for each guest. Guests with tickets to the Christmas Party may enter the park as early as 4 p.m. on the event night. One of the special things about Mickey’s Very Merry Christmas Party are the additional meet and greets. Favorite and rare characters can be found at several locations around the park for autographs and pictures. Some characters have gotten into the holiday spirit with costumes of their own. Guests can enjoy all of their favorite holiday snacks as they travel around the park. Stop by select locations for complimentary hot chocolate, candy, cookies, cider and more. For those looking for a little more indulgence, deliciously themed holiday desserts are available for purchase at several quick service locations. Mickey Mouse and friends host a celebration at the Cinderella Castle stage four times each night! Everyone will enjoy the dancing, music and festive fun. 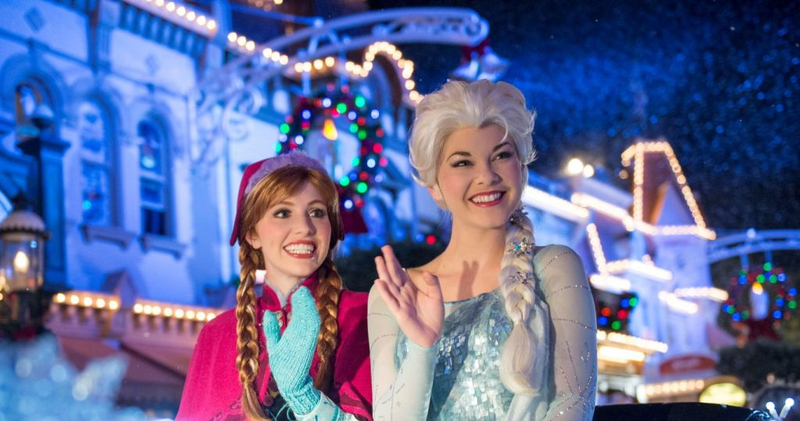 Join your favorite sister duo at Cinderella Castle for one amazing show as Queen Elsa works some icy magic to create a prefect holiday centerpiece during "A Frozen Holiday Wish." Guests can make their celebration even better, by making reservations for a delicious dinner at Magic Kingdom’s table service restaurants. Dessert party reservations can also be made and include private fireworks viewing. Main Street has been transformed into a winter wonderland and this parade will have guests wishing every day was Christmas. From classic Disney characters and skating snowflakes, to nutcrackers and gingerbread men this parade is a holiday spectacular everyone is sure to love. Be on the lookout for Santa Claus too! The nighttime sky lights up with beautiful colors, in this magical holiday show. Watch as the castle sparkles and glows while along with favorite Disney and Christmas songs for a perfect festive finale.